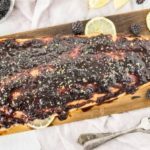 Fresh salmon generously slathered with a sticky, sweet, fruity and slightly spicy blackberry-chipotle glaze and grilled on a cedar plank. 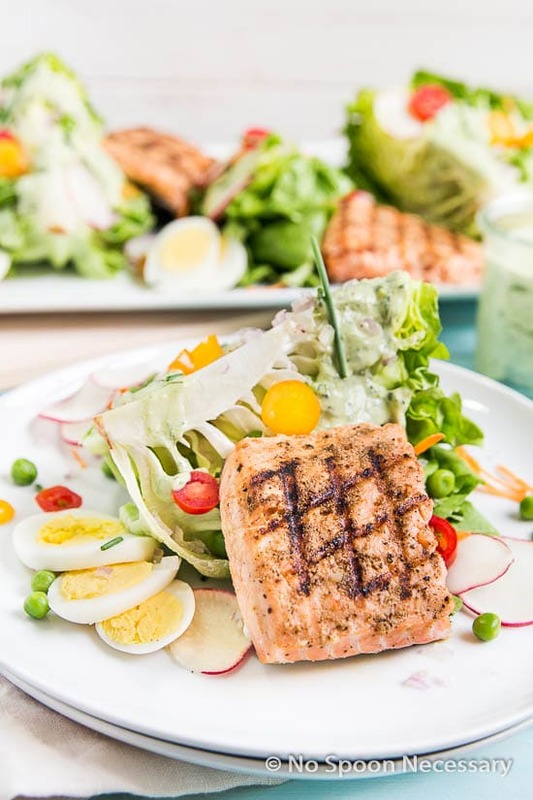 This salmon is easy, elegant and perfect for summer entertaining! If you are in the US, how was your 4th of July?? And for all my friends to the north, how was your Canada day? Please tell me you guys ate so much you had to put your fat kid, stretchy-waist pants on. We had a really great weekend, I worked a bit (like always) and we grilled a lot. I’m talking afternoon and night grilling sessions. It was awesome, but then again I’m pretty easy to please. Oh, and I absolutely cannot forget to thank you guys for all the birthday wishes!! You all rock my world! I had a nice, quiet birthday. We didn’t do anything super special, but that was by my choice. Staying home in my pajamas with Boy and our fur child is my jam. I told you – easy to please. There was also a 2 pound lobster tail involved, so maybe I’m easy to please as long as you feed me delicious things. Anyways, I’m going to keep things short today. (Minus all the rambling I did up there ⬆️, obviously) I don’t know about you, but I’m still recovering from the long weekend. And my brain is already set to idle into the next weekend. I blame it on summer. This season is no good for productivity. Or maybe it’s my new older age. Either way, I’m going to cut to the chase food. So I’m just going to be honest here. These photos are not my favorite and I’m less than thrilled with how they came out. 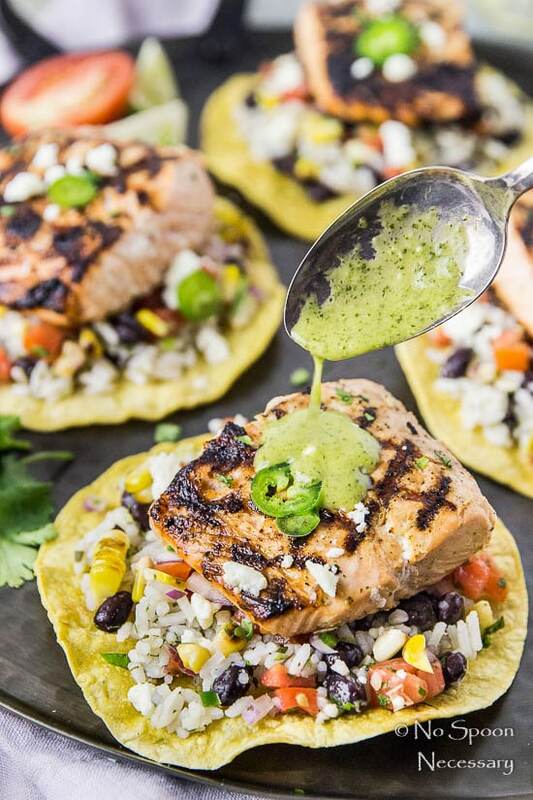 But, this salmon – it is insanely delicious (so don’t judge the salmon from these photos)! 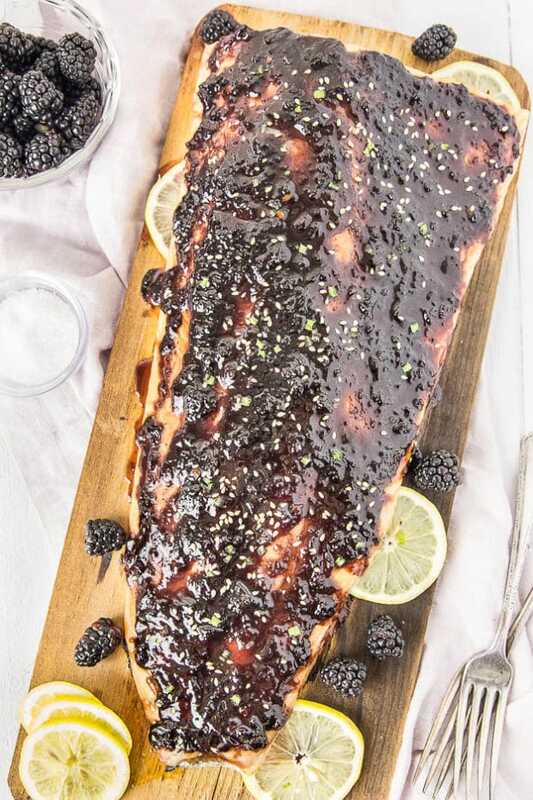 The Asian inspired blackberry-chipotle glaze is savory, sweet, a tad smoky, slightly spicy, superbly sticky and fantastically fruity with nuances of ginger and garlic. 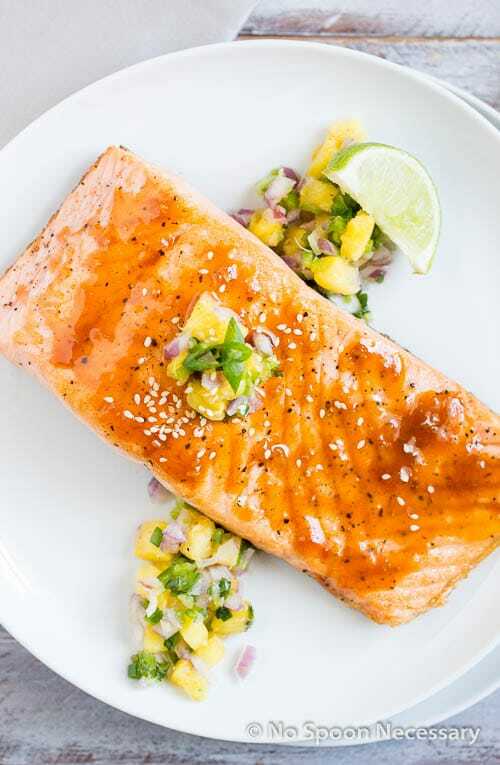 When generously slathered on luscious, rich salmon and grilled on a cedar plank this dish becomes an umami flavor bomb. 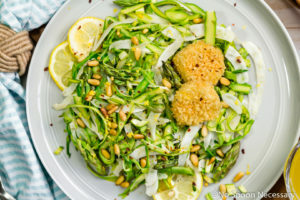 But, not only is this dish glorious in the taste department, it is also a cinch to throw together. 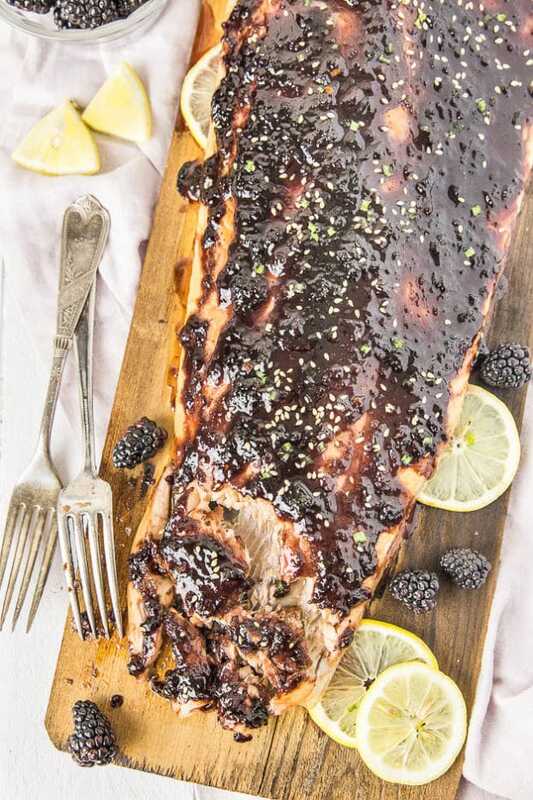 Simply simmer and reduce the glaze, place a side of salmon on a soaked cedar plank, liberally smear the glaze on top and grill. Stellar summer salmon dinner served! I left the skin on my salmon because it peels right off after cooking, but if you are fussy about that simply remove the skin prior. No harm, no foul. 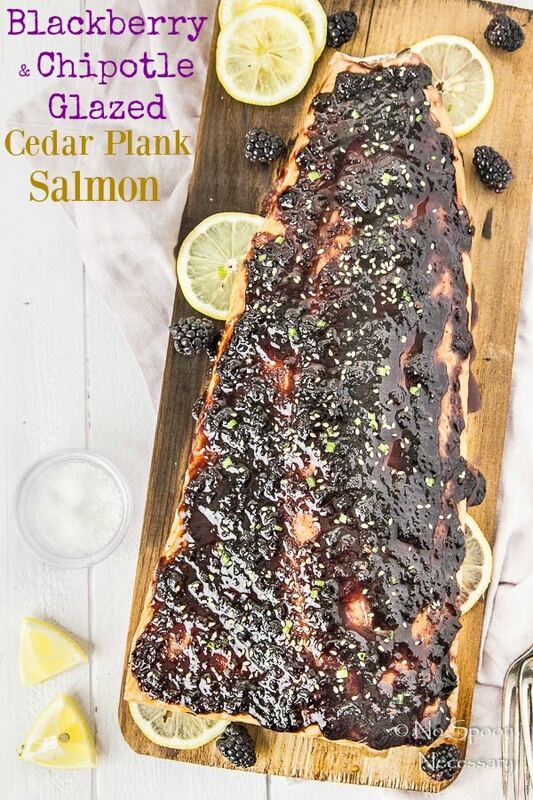 If you are using an entire side of salmon, like I used here, you will need a large cedar plank. My plank was 7’’x16’’ to give you a rough idea. No matter what size plank you use, you will need to soak it for at least 1 hour prior to grilling. I soaked mine in sake to give it a crisp Asian flavor, but I’ve used orange juice before, which will add an essence of citrus. You can also use water if you are watching your budget. Just make sure you soak it in some kind of non-flammable (<–duh) liquid for at least one hour. The glaze is a bit spicy. If spicy isn’t your thang, use ½ a chipotle pepper instead of a whole. 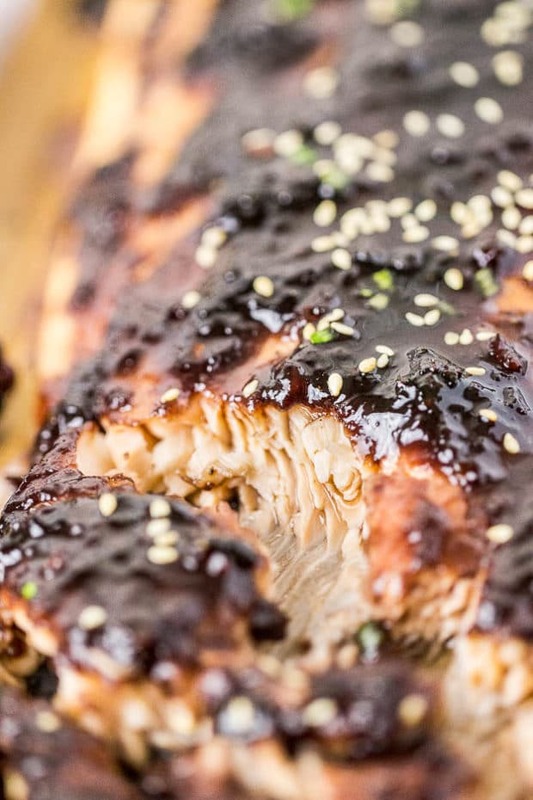 When the salmon comes off the grill you can caramelize the glaze by running it under the broiler for a minute or two. To do so, transfer the salmon, still on the plank, directly to the oven. Place a sheet pan on the rack below to catch any drippings. Broil for a minute or so, watching it very carefully to prevent burning. I actually did this with my salmon, but this step is completely optional. 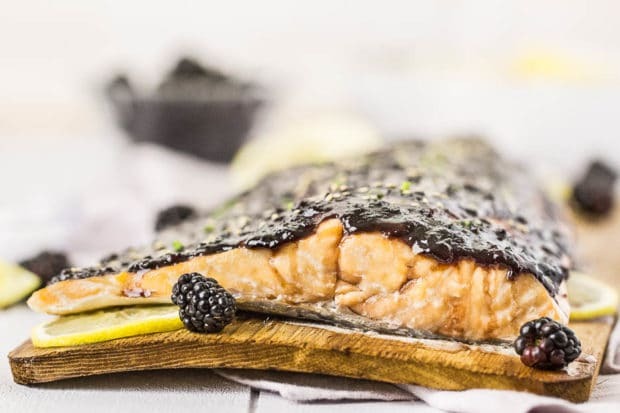 Step up your salmon game in an easy and elegant way with this Blackberry-Chipotle Cedar Plank Salmon. Until Monday friends, cheers – to stress-free grilling! At least 1 hour before grilling: Soak the cedar plank in sake. In a small sauce pan: Add preserves, chipotle chili, ginger, garlic, hoisin, soy sauce, lemon juice, salt and pepper. Stir to combine well. Place over medium heat and bring to a simmer. Reduce heat to maintain a simmer and cook for 15 minutes, stirring occasionally. Set aside to cool completely. 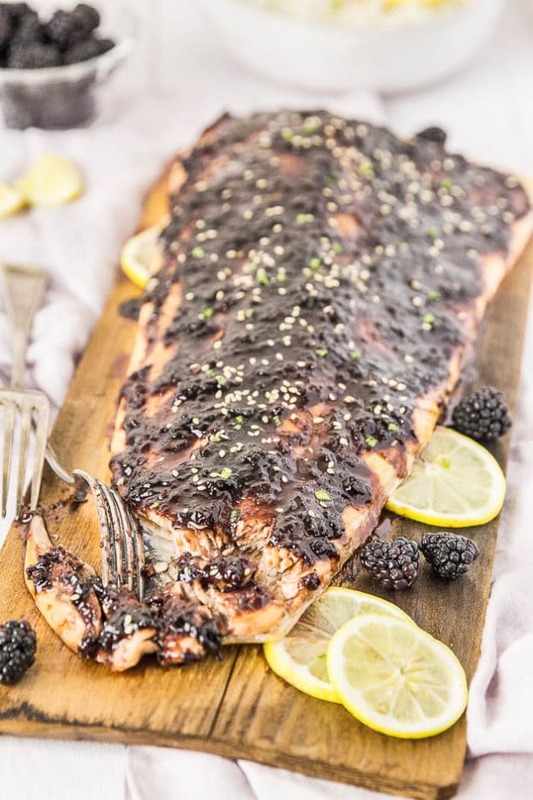 Heat charcoal or gas grill to 425 degrees F.
Place the entire piece of salmon, skin side down, on top on cedar plank and make sure it is completely on the plank and not hanging off. Generously brush the preserve mixture on top of the salmon. Season liberally with salt and pepper. Place the cedar plank on the grill grates and cover grill. Grill for 12-15 minutes, or until desired doneness (salmon is done when it is pink in the center). 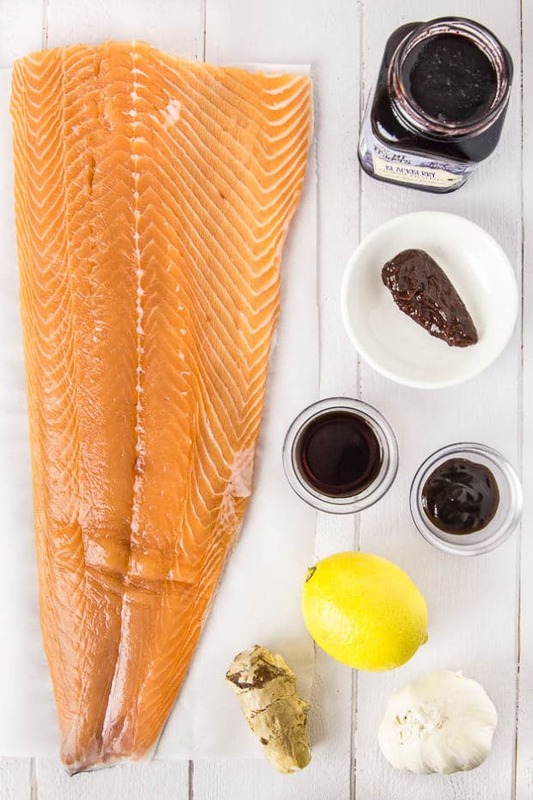 Use a large spatula to transfer the salmon still on the plank to a clean surface to rest for 3-5 minutes. After resting transfer salmon to a cutting board. 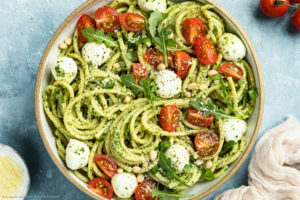 Cut into desired portions, serve immediately and enjoy! 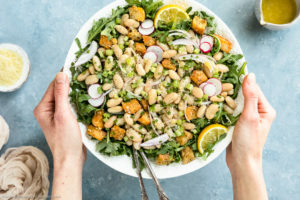 *You can substitute a salmon filet with the skin already removed, however after grilling the skin will easily peel off. 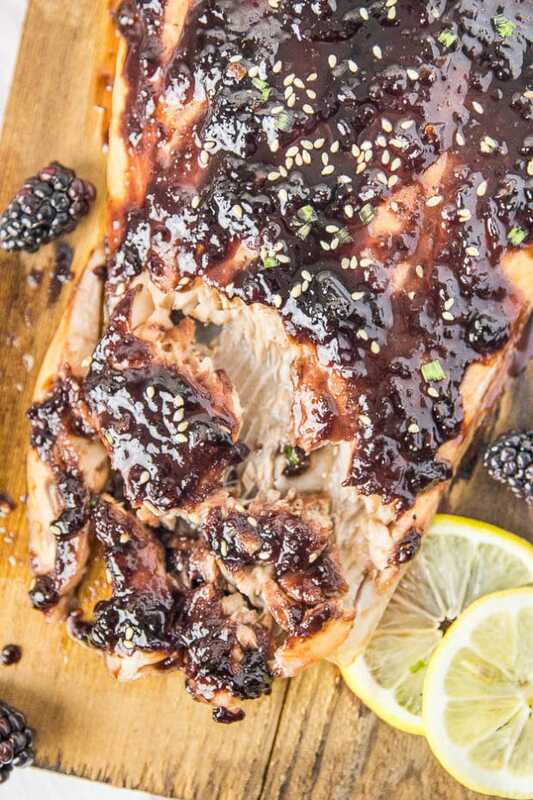 *You can marinate the salmon, brushed with preserves for 30 minutes if desired. *Optional: To caramelize glaze, adjust oven racks to highest and middle positions. Place a large sheet pan on middle rack to catch drippings. Pre-heat oven to highest broil setting. 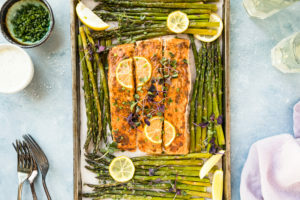 When finished cooking salmon on the grill, place salmon still on plank directly in the oven on the top rack. Broil 1-2 minutes, watching salmon carefully to prevent burning. 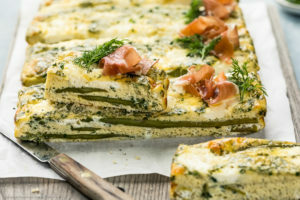 I want yo make this salmón for a dinner party , but wont be able to grill it! What do you suggest?? Oven baked?or broli??? Hi Aline! 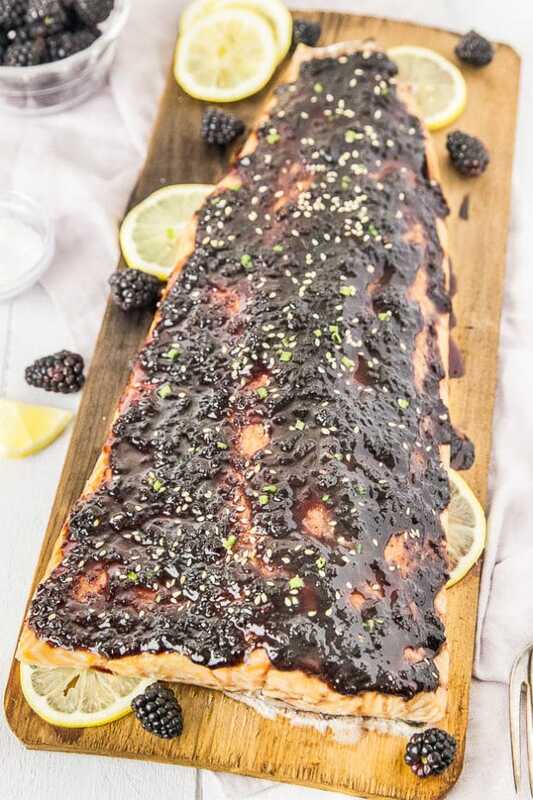 You can absolutely bake the salmon, just follow the same instructions as for the grill – 425 degrees f. If you want to run the broiler after baking for a couple minutes to carmelized the glaze a bit, you can do that as well (I actually recommend it, but keep a CLOSE eye on the salmon)! 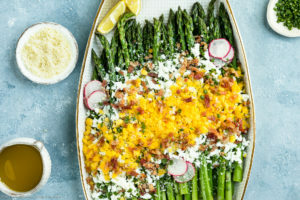 Hope you and your dinner guests love this as much as we do! Cheers and thanks for stopping by!